Holton Lane is a City street with the scale and 'bones' of a great community center. With many attractive buildings, US Post Office, and plenty of parking, the City is working with businesses and properties owners to make it more than what it is today. The City produced A Vision for Holton Lane in 2009 with design guidelines for storefront and streetscape improvements. 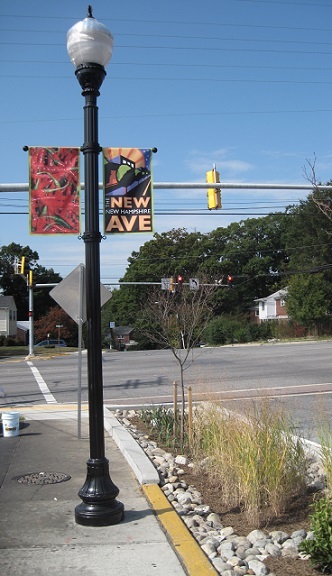 Subsequent streetscape improvements on Holton Lane were completed, adding street lighting with colorful banners, new street furniture, and landscaping. A green and inviting entrance to Holton Lane at New Hampshire Avenue was created that enhanced pedestrian safety at the intersection and provided a new stormwater infiltration facility. 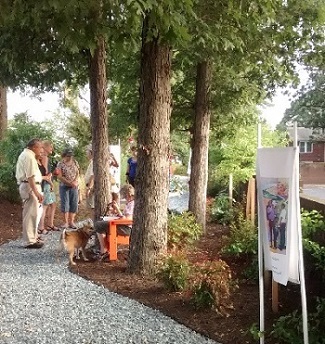 In 2015, new landscaping was installed in the only public space in the Takoma/Langley Crossroads area, an overgrown strip of land along the west side of New Hampshire Avenue extending north from Holton Lane, a.k.a. the "Crossroads Green Space". A celebration for the first phase of the Crossroads Green Space improvements occurred on July 28, 2015. Neighbors came out to meet and enjoy the space, offering suggestions for ongoing improvements to the area. Complete this short survey for City planners to help guide future installations of public art, educational signage, and unique seating in the Crossroads Green Space.